"This year has been good for me; I have achieved a lot and gained a lot of experience this year. There were also victories and disappointments. I took part in the championship of Georgia, Europeans and the Worlds. I won all the competitions on the left hand. I did everything as it was necessary. But with my pulling on the right hand I am very disappointed". The past year has turned out to Levan saturated, but there is a tournament where Levan was unfortunately not able to participate due to injury. Of course, we talk about the Professional World Cup Zloty Tur. We believe that he could get into the top three prize there. 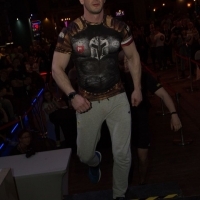 "I watched Zloty Tour and I think that the fight of ultimate weight category should be carried out as a separate tournament, but not on the same day. And so - I do not understand who is stronger - Andrey Pushkar or Dmitry Trubin. I can not say what would happen if I was there too". "I want to wish everyone, not only those who cheers for me, but to all who love our sport, to be healthy and successful and everything will be all right!". These are the results of the year this talented athlete had. Levan is happy for his victories, but also accepts the lesson of the defeat, making the appropriate conclusions. We still believe that the sports season 2016 was successful for him. Stay with us and stay tuned to armpower.net.